Definition: The phenomenon of ionisation of surrounding air around the conductor due to which luminous glow with hissing noise is rise is known as the corona effect. Air acts as a dielectric medium between the transmission lines. In other words, it is an insulator between the current carrying conductors. If the voltage induces between the conductor is of alternating nature then the charging current flows between the conductors. And this charging conductor increases the voltage of the transmission line. The electric field intensity also increases because of the charging current. If the intensity of the electric field is less than 30kV, the current induces between the conductor is neglected. But if the voltage rise beyond the 30kv then the air between the conductors becomes charge and they start conducting. The sparking occurs between the conductors till the complete breakdown of the insulation properties of conductors takes place. Corona effect mostly occurs at the sharp point of insulators. Air is not a perfect insulator, and even under normal conditions, the air contains many free electrons and ions. When an electric field intensity establishes between the conductors, these ions and free electrons experience forced upon them. Due to this effect, the ions and free electrons get accelerated and moved in the opposite direction. The charged particles during their motion collide with one another and also with the very slow moving uncharged molecules. Thus, the number of charged particles goes on increasing rapidly. This increase the conduction of air between the conductors and a breakdown occurs. Thus, the arc establishes between the conductors. Effect of supply voltage – If the supply voltage is high corona loss is higher in the lines. In low-voltage transmission lines, the corona is negligible, due to the insufficient electric field to maintain ionization. The condition of conductor surface – If the conductor is smooth, the electric field will be more uniform as compared to the rough surface. The roughness of conductor is caused by the deposition of dirt, dust and by scratching, etc. 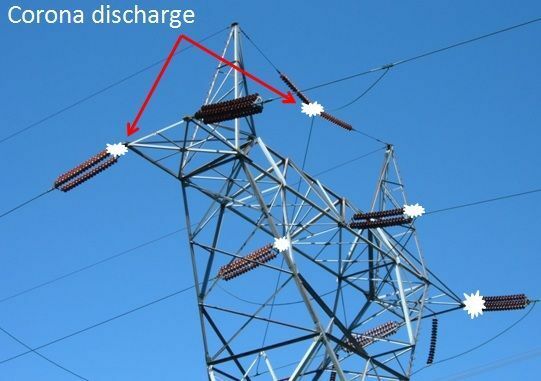 Thus, rough line decreases the corona loss in the transmission lines. Air Density Factor – The corona loss in inversely proportional to air density factor, i.e., corona loss, increase with the decrease in density of air. Transmission lines passing through a hilly area may have higher corona loss than that of similar transmission lines in the plains because in a hilly area the density of air is low. Effect of system voltage – Electric field intensity in the space around the conductors depends on the potential difference between the conductors. If the potential difference is high, electric field intensity is also very high, and hence corona is also high. Corona loss, increase with the increase in the voltage. The spacing between conductors – If the distance between two conductors is much more as compared to the diameter of the conductor than the corona loss occurs in the conductor. If the distance between them is extended beyond certain limits, the dielectric medium between them get decreases and hence the corona loss also reduces. The glow appear across the conductor which shows the power loss occur on it. The audio noise occurs because of the corona effect which causes the power loss on the conductor. The vibration of conductor occurs because of corona effect. The corona effect generates the ozone because of which the conductor becomes corrosive. The corona effect produces the non-sinusoidal signal thus the non-sinusoidal voltage drops occur in the line. The corona power loss reduces the efficency of the line. The radio and TV interference occurs on the line because of corona effect. Conductor diameter – For reducing corona loss, this method of increasing conductor diameters is very effective.Diameters of conductors can be increased by using hollow conductors and by using steel-cored aluminum conductors(ACSR) conductors. The voltage of the line – Voltage of transmission lines is fixed by economic considerations. To increase the disruptive voltage the spacing of the conductors is to be increased, but this method has some limitations. Spacing between conductors – If the space between conductors increases, then the voltage drops between them also increases due to increase in inductive reactance. Disruptive voltage is the minimum voltage at which the breakdown of air occurs and corona starts. Visual critical voltage is the minimum voltage at which visible corona begins. Also See: What is Corona Power Loss?